Two lectures in November. Come and join the excitement! Last year, a series of academic lectures was given in Hong Kong regarding the Hanfu movement. To much acclaim, The University of Toronto Northshore Society has graciously organized with the cooperation of the Han Chinese Culture Association at the University of Toronto Scarborough Campus for the same lectures to be held in Toronto! For those who have missed the first lecture, please join us for the second week lectures, and for those who have attended the first lecture, we look forward to continuing our discussions in the coming week! When it comes to Chinese clothing, the Cheongsam or tight-fit Qipao comes to mind. Since 2001, ‘Tangzhuang’ was popularized as the ‘modernized’ ethnic Chinese dress, repatriating a heritage of 19th century Chinatowns as the new chic. The new generation of Chinese traditionalists disagreed though – pointing out that the dress is a misappropriation of imperialism and colonialism. With the power of the Internet, these young people recreated and wore HANFU – Chinese cross-collared robes recently only seen in …TV dramas and paintings, but were met with misunderstanding, hate, and even “racial” violence by their own people, in China and in its diaspora communities around the world. What’s the fuss with identifying “Chinese dress”? Why would Chinese attack those wearing its own fashion tradition? 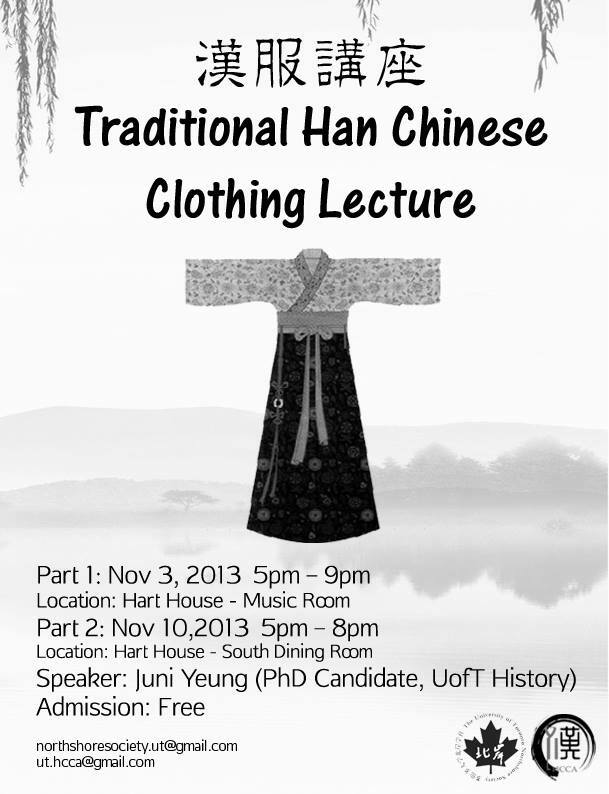 Juni Yeung (PhD Candidate, UofT History) would like to talk and share the joys and tears on fashion, identity, and a facet of an Internet-connected, de-colonializing global Chinese community. You can download the slides for the lecture, as well as relevant media, as they are released after post-production. EDIT* Lecture slides for session 2 are now up.